So, last week I showed you what I made for Mr Napping for our 5th wedding anniversary in two weeks. Don’t worry, he doesn’t read my blog so he’ll still be surprised. You should check that out if you’re looking for a gift for your someone special… Valentine’s Day is coming up (wink, wink). If you’re looking for something a little less time consuming – because painting 52 little wood sticks was just that – you’ll love what I have for you today. I’ve been out of the printable scene for a while and I think this is a great little freebie to jump back in with. You’ll be able to make a gift for your someone special for practically FREE! 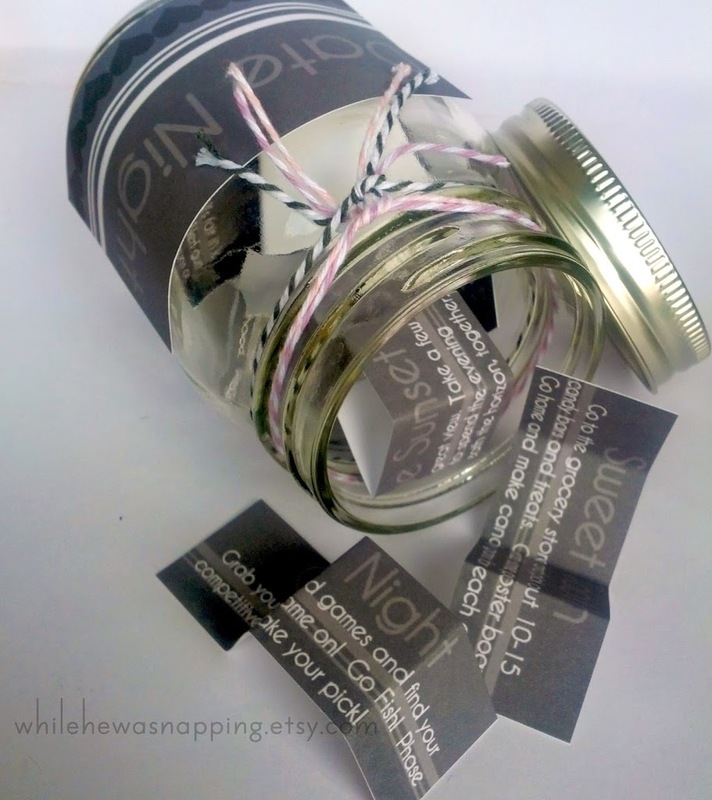 – Free PDF of the Jar Label and Date Ideas. 1. Gather your jar and print off your printed PDF (just click the link above). I recommend printing these off on card stock for a sturdier hold up. You could use a Mason jar, a peanut butter jar you’ve cleaned out, or an old spaghetti sauce jar you’ve washed. 2. Cut apart the dates and the jar label with scissors or a paper cutter. 3. Fold the strips of paper and drop them in the jar. I found that folding them in fourths worked the best. They stuck together when I folded them in half and it was hard to pull out just one slip of paper. 4. You may want to spray paint the lid of your jar or cover it with scrapbook paper. 5. Tie your Baker’s twine around the jar and affix the label to your jar with tape or glue. You could even use clear contact paper for a more waterproof label. Grab a free copy of this file, without watermarks, from HERE. This file is for PERSONAL USE ONLY. If you want to share the file with others, please give them this web page address and they can download their own copies. No portion or alterations of this file may be sold or claimed as your own. I reserve all rights. I like to share, but let’s all play nice. Please and thanks. 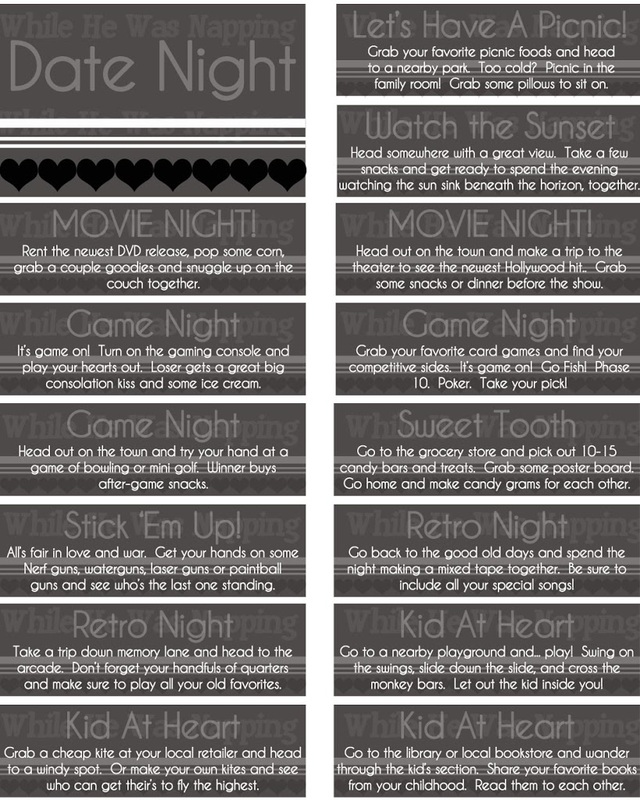 If you’re interested in different date ideas or more ideas for a larger kit, you can purchase 32 more date night strips from my While He Was Napping Etsy Shop. Files are instant download, so you’ll have them in your hot little hands (or on your hot little hard drive, as the case may be) as soon as your payment is processed! So creative . . . thanks for sharing! Love this idea. thank you for sharing. Visiting from Sugar Bee Crafts hop. http://www.thememorynest.blogspot.com Would love for you to stop by my blog. Ooooh, Krista, I love these!! Pinning! Thanks for sharing several of your fun projects at Shine on Fridays this week! How fun! =) Pinned it!